Moreover, the circumstances leading to the lawsuit against Fraser Hillary’s has similarities with a commercial liability coverage dispute in B.C. involving two large insurers. 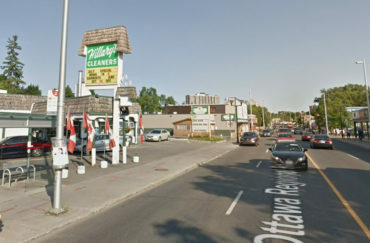 Fraser Hillary’s, a dry cleaners on Bank St. north of the Rideau River (pictured), used chemicals containing tetrachloroethylene (a degreaser) and trichloroethylene between 1960 and 1974. Some of those chemicals spilled into the ground. It was in 1974 that the dry cleaner brought in new equipment that pretty much eliminated pollution risk. But the cleaner was sued by Eddy Huang, who owns nearby properties and sought money to clean up his properties and reimburse him for environmental professionals he had hired. Huang was awarded more than $1.8 million in damages by the Ontario Superior Court of Justice in 2017, a ruling upheld on appeal. The dry cleaner applied for leave to the Supreme Court of Canada, which announced April 11 it will not hear an appeal. The top court does not issue reasons for denying leave to appeal. Another Canadian dry cleaner sued by neighbouring property owners over pollution was West Van Lions Gate Cleaners Ltd., which filed claims with both Intact Insurance Company and Economical Mutual Insurance Company. In West Van Holdings Ltd. v. Economical Mutual Insurance Company, released April 5, the British Columbia Court of Appeal ruled that neither Intact nor Economical had a duty to defend West Van because the CGL policies had pollution exclusions. Initially, a B.C. Supreme Court judge had ruled that Economical and Intact did have a duty to defend West Van. While no insurers were parties in Fraser Hillary’s Limited v. Eddy Huang, the circumstances of that Ontario case are of interest to commercial brokers because anyone with responsibility over property – whether an owner or tenant – can be held liable for contamination that occurred decades earlier. A key argument – which the dry cleaner lost on appeal – was that the Ontario Superior Court of Justice judge Pierre Roger “retrospectively applied” part X of Ontario’s Environmental Protection Act, which became effective in 1985. A section of the 34-year-old Ontario law gives plaintiffs the right to compensation – for losses as a result of spills of pollutants – from persons having “control” of those pollutants. “While the spills may have occurred before Part X of the EPA was enacted, Fraser’s obligations under that part of the legislation are ongoing,” Justice William Hourigan of the Court of Appeal for Ontario wrote in its unanimous ruling in 2018. Even if the spills of dry cleaning chemicals stopped in 1974, the obligation to clean up the pollution remains, Justice Hourigan wrote. Huang owns property south of Fraser Hillary’s. Engineering reports indicate that ground water is carrying dry cleaning chemicals from soil on Fraser Hillary’s property southeast into the soil on Huang’s property. In 2002 Huang sought financing from a bank so he could develop properties he owned. Huang got an environmental report which stated the concentration of TCE on his property exceeds provincial standards and recommends remediation. “Up to the mid‑70s, the adverse effects of [tetrachloroethylene] were unknown to both the industry and the environmental engineering community. It was then understood that you could dispose of [tetrachloroethylene] by pouring it onto the ground. The thinking was, apparently, that it would evaporate,” Justice Roger wrote in his 2017 ruling. From 1960 to 1974, used tetrachloroethylene was be stored by Fraser Hillary’s in cardboard boxes in the parking lot at the rear of its property and left there until the weekly garbage collection, Justice Roger added.